This weekend, dozens of jazz performers delighted attentive audiences on the beautiful Newport waterfront – among them was up and comer and crowd favorite Jamie Cullum, British jazz pianist and singer songwriter. Cullum appeared at the Carefusion Newport Jazz Festival to kick off his 2010 world tour in support of his new album, The Pursuit. In addition to performing at the Festival, Cullum also worked as a journalist, interviewing his fellow performers for a BBC Radio show, which goes live today. 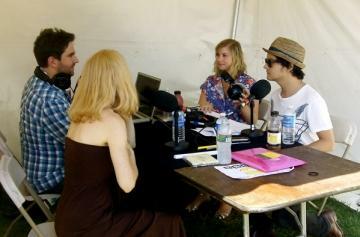 Here, right, he speaks to Maria Schneider, who’d just come off the Fort Stage with her jazz orchestra. Offstage, Cullum was as enthusiastic about music, and humble. GoLocalProv caught the crowd favorite in between BBC interview stints to talk about what first drew him to jazz and what it’s like to play a festival with his role models in the industry.